Just before publishing a post last week, I noticed that the “Get Shortlink” shortcut was missing from my WordPress editor. As I was in a rush, I went ahead with publishing and the full-length URL went out with the tweet. As that was not something I had done and is functionality that I use all the time, I wanted it back. Finding the answer wasn’t easy. People had seen this behaviour before but as a solution, some talked about installing plugins while others talked about editing PHP files. In the end, it wasn’t that drastic so I thought I should do a quick note on that. There might be other reasons for it but I do remember temporarily disabling/enabling Jetpack a few days prior to that, due to a performance issue I was investigating for my blog (another post in the making). Doing so, also removed my settings so I restored whatever I could remember but I suspect that’s also what triggered the disappearance of “Get Shortlink”. A list appears. Scroll down to “WP.me Shortlinks”. If you hover above it, “Activate” should appear. Click it. That’s it! 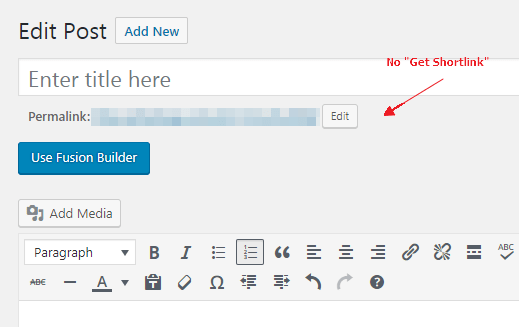 The “Get Shortlink” button should reappear in the WordPress editor.